Skagway is an interesting little town which experienced a boom in population during the Klondike Gold Rush of 1897. 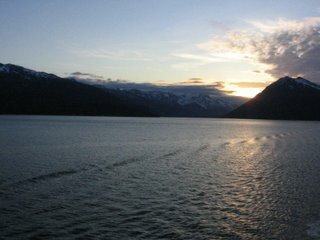 The Chilkoot Trail, established by Tlingit traders and used by adventurous gold seekers, is still in use today. 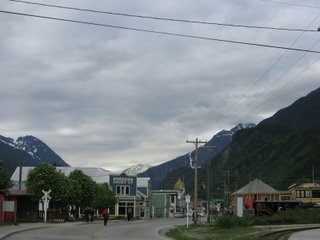 We looked through the old photographs at the Klondike Gold Rush National Historic Park, then wandered the wooden walkways of the streets, drinking in the atmosphere. A glorious sunset over the Lynn Channel was a phenomenal end to the day. 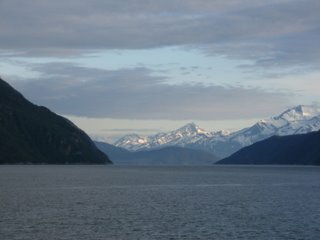 From Skagway, Alaska, we took a catamaran down the Lynn Channel, passing by tremendous roaring waterfalls cascading down the steep fjords. Sawmill Falls was particularly stunning, falling hundreds of feet to the deep waters of the channel. We landed on the beach of a remote spot called Glacier Point. 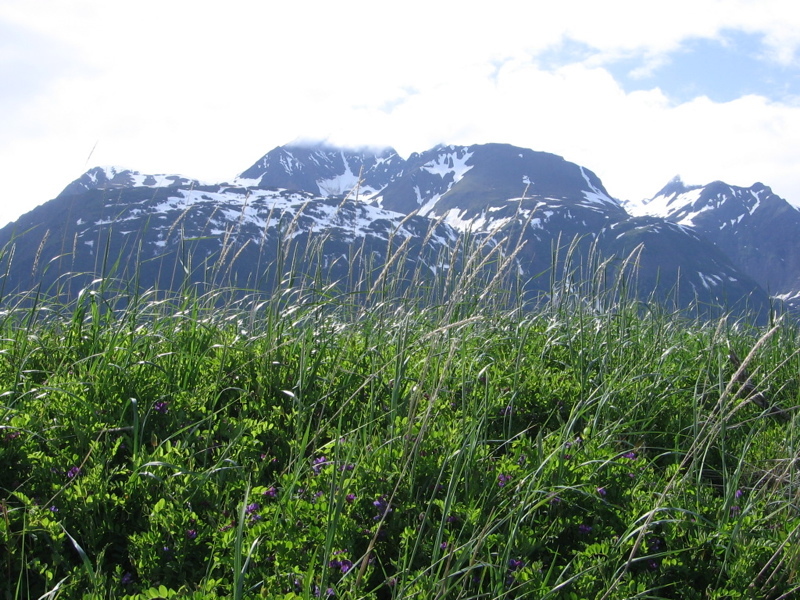 Wildflowers covered the beach, from purple lupine to strawberries and tall, waving grasses. From there we hiked through the new forest to our canoe. 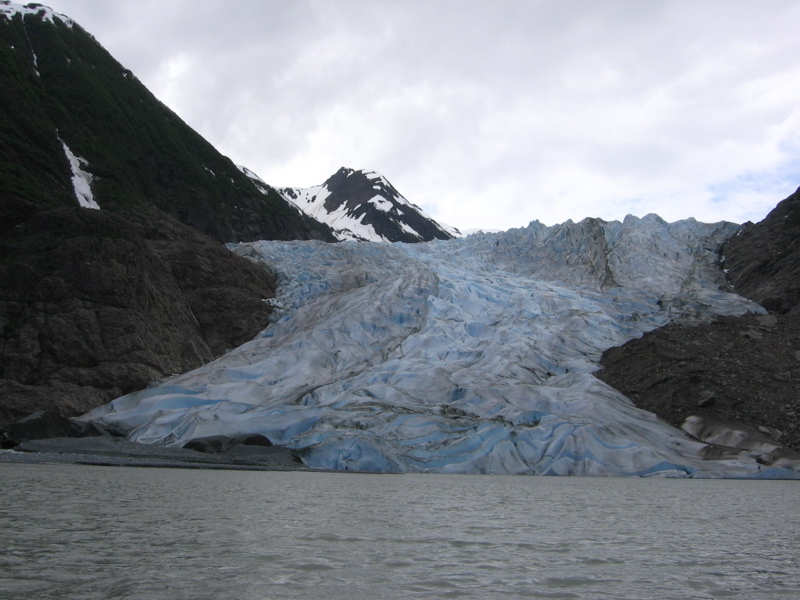 Until very recently, the Davidson Glacier spilled out into the Lynn Channel itself. 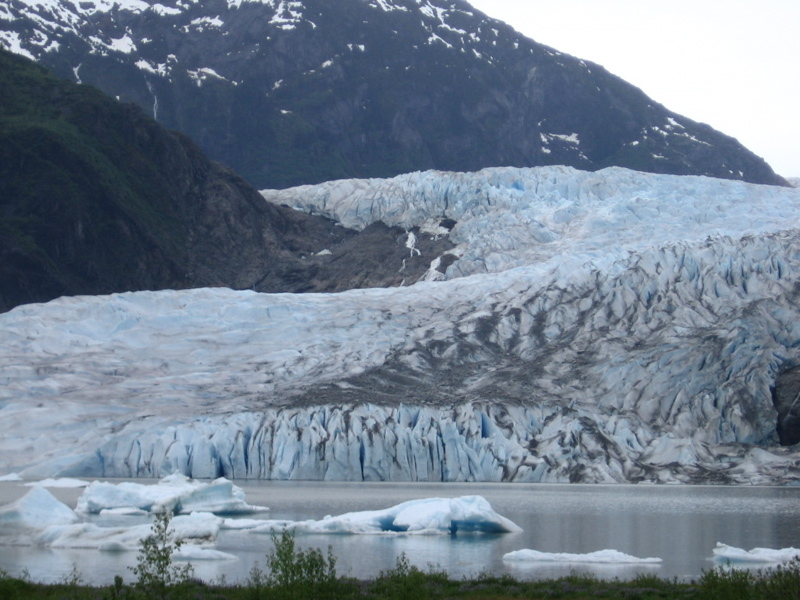 But now the glacier has receded more than a mile inland. This new forest has grown in the receding ice's wake. Inside the canoe, we paddled out in the icy waters to the chilly, windy base of the massive glacier. 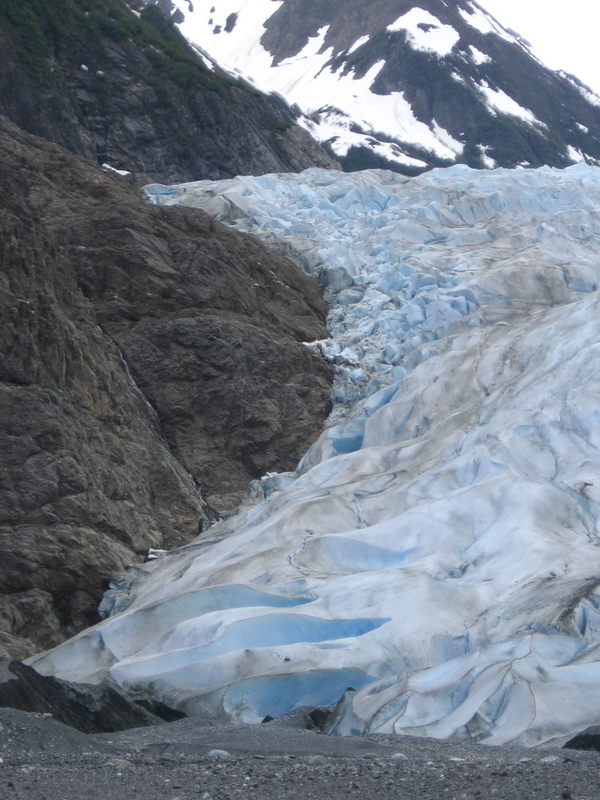 Huge blue crevasses yawned wide and the glacier extended up into the tremendous Juneau Icefield above us. 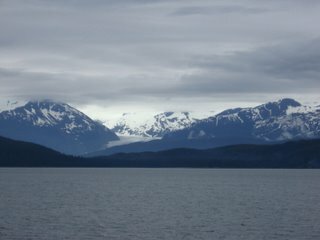 Icebergs floated in the water around us, and as we craned our necks upward, we could see the jagged peaks of the snowy Chilkat Mountains before us, and the equally stunning snowy peaks of the Chilkoot Mountains behind us, which actually lie in Canada. ...this is where they'd stay. We took a boat out of Auke Bay (near Juneau) to watch for whales. We passed Admiralty Island, home of the highest concentration of brown bears in the world. 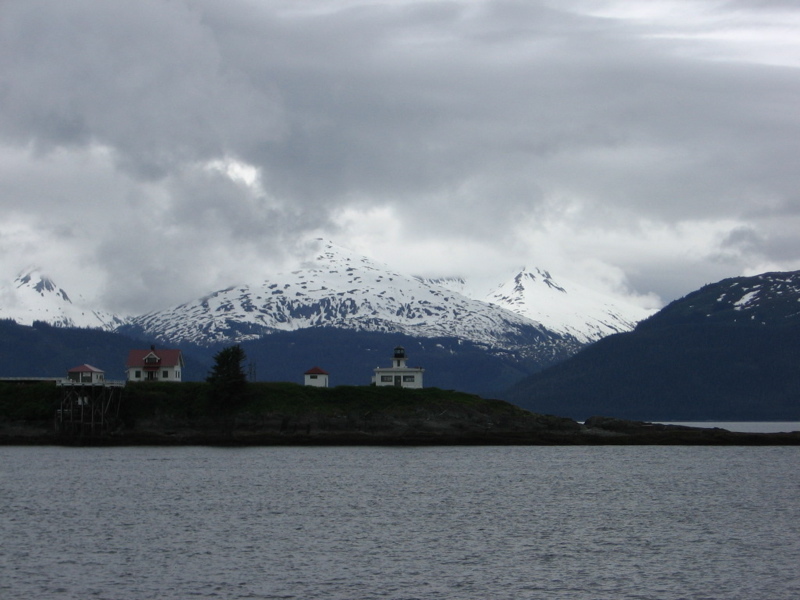 The Tlingit people call this island "Kootznoowoo," which means "Fortress of the Bear." We saw a host of humpbacks breaching the water. One even did a lunge feed, thrusting out of the water, mouth full of krill-rich water. Several harbor seals swam in the wake of the whales, picking up scraps. A buoy we passed held three sleeping sea lions and a bald eagle to boot. On the way back, we passed by the Juneau branch of the National Oceanic and Atmospheric Administration (NOAA), one of my favorite resources. 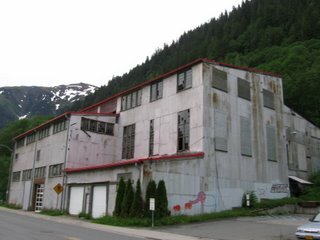 We made port in Juneau, Alaska. I knew we must be approaching a "big" city (Juneau has a population of 30,000) because the vast stretches of wilderness gave way to float planes flying overhead every few minutes. 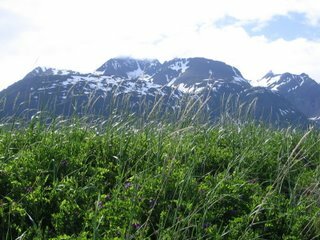 At last the city stretched out before us, the jagged steep mountains rising up from all sides. It is unreachable by road, and you must visit it by sea or by air. From Juneau we traveled to the Mendenhall Glacier, which lies in the beautiful Tongass National Forest, a vast forest covering much of southeast Alaska. 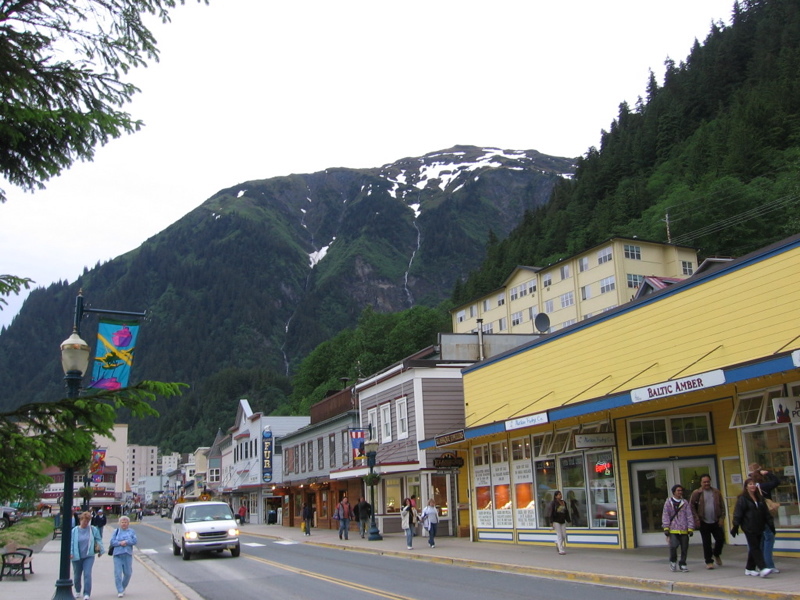 The Tongass is the biggest national forest in the U.S. 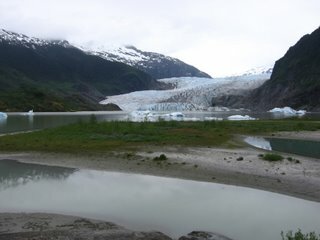 The glacier flows from the Juneau Icefield, and spills out into a lake at the foot of the glacier. The cold wind blew down from the ice, and large icebergs floated in the water, which ran thick with rock flour. John Muir was here in the late 1880s...I like to think of what he saw back then, with the glaciers much more vast than they are now.